Crain’s Chicago Business cites Chicago area unemployment research conducted by Teresa Córdova, director of the Great Cities Institute, and Matthew Wilson, an economic development planner with the institute, in an article examining factors related to the area’s stagnant home prices. 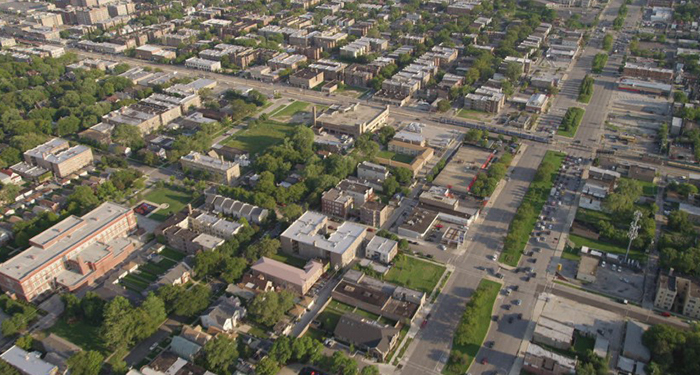 Córdova and Wilson, who are both quoted in the piece, note that industry departures and population declines from the south suburbs and South Side have led to less demand for housing there and the declining home values. In any discussion of Chicago real estate, it’s crucial to keep in mind that the recovery has been running on two different tracks. Home prices have been rising fast in hot North Side neighborhoods like Wicker Park, Bucktown and Logan Square, putting purchases beyond reach for many. But they’re stagnant or even slipping in other neighborhoods and suburbs. A marketwide figure like Case-Shiller’s index covers them all, from Avondale’s 11.7 percent increase in 2017 through unchanged values in Elmhurst to a decline of 7.8 percent in Wilmette. The labor market has been on two tracks as well, according to two researchers at the Great Cities Institute at the University of Illinois at Chicago: Teresa Cordova, the institute’s director, and Matt Wilson. At 10.1 percent, black unemployment was more than twice the general unemployment rate of 4.9 percent in the third quarter. On top of that, they note, nearly all job growth has been in professional and service jobs, not the manufacturing jobs that were the bedrock of the middle class in the 20th century, and they’re mostly downtown, not in neighborhoods or inner-ring suburbs.